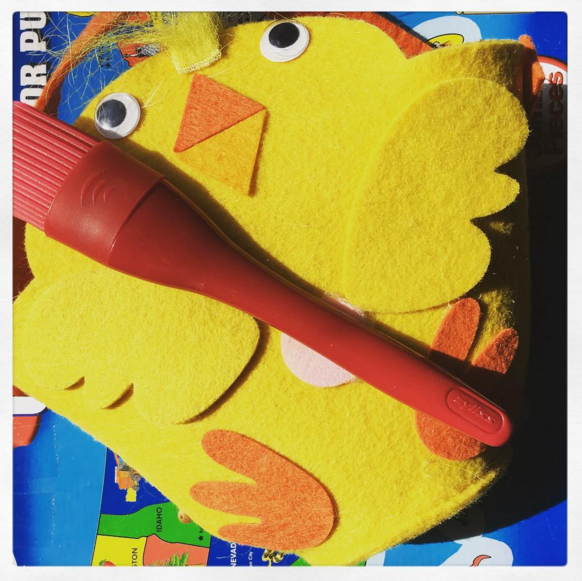 Today for #TwinTuesday, Lee and I have Easter-related items and pastry brushes. Mine's made of silicone. Funny you should mention silicone because I need to review my DIY project from yesterday. Here's what I did: I replaced my bathroom faucet. Let's consider the aspects of this project. Research: I give myself 3.5 of 5 stars. I watched YouTube videos and texted my friend Robin, who is a DIY machine. Could I have done more reading about plumbing terms like gasket and flange? Probably. I still can't, even after perusing Wikipedia entries and scouring Google images, positively identify a flange. Shopping: I give myself 5 of 5 stars. I selected a reasonably-priced faucet by Delta that met Dan's specifications. His specifications were, "I actually don't like separate handles for hot and cold water." Direction-Following: I give myself 5 of 5 stars. I followed all directions to a perfect T. I paused the YouTube video after each step and followed the my online coach's instructions exactly. I felt powerful. Actually, I felt invincible. I removed the faucet and put a new one in its place! Bring on foreign policy and climate change! Trouble-Shooting: Sadly, even after I followed all of the directions, my faucet still leaked at the connection to the basin. I tried reassembling it. I tried adding more plumber's putty, which I learned about precisely for this project. I tried using teflon tape, also a product I didn't even know about until yesterday. I'm sorry to say that, at this moment, my sink is leaking at the bottom of the basin. Nevertheless, I give myself 3 of 5 stars for trouble-shooting. It's not my fault that my efforts have failed. Next, I'm buying a washer. Could I have done a better job of researching washers? Maybe. That's why I only earned 3.5 stars on Research. Patience and Sticktoitivenss: I deserve a solid 4.5 stars. Is it annoying that a job that should take 45 minutes to an hour has taken me over three hours? Yes, it is. Is it annoying that even after all of those minutes spent on the project, my sink still leaks? Yes, it is. But, have I given up and called a professional? NO. NO, I HAVE NOT! And I won't! I can DIY with the bottom 25 percent! Calling a professional is how I like to deal with these situations. But I have some admiration for you all the same. And I'm feeling a bit of awe as well.